The most talked about exhibition "Defining Beauty: The body in ancient Greek Art" is on at the British Museum. This show tries to understand the aesthetic values of ancient Greek art. Chryssa Verghi studied at the National Superior School of Fine Arts in Athens and continued her studies at the Fine Arts School of California State University in Long Beach, USA. Her deep relationship to the sea is very prominent in her work. 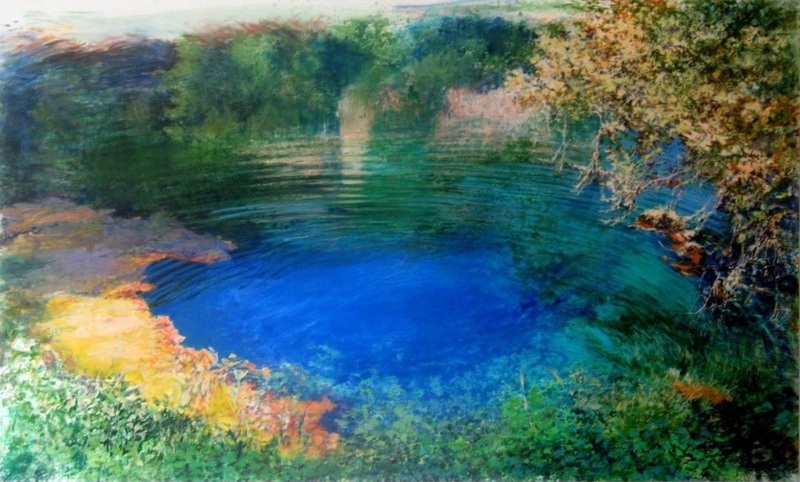 Not only is water her main subject but Verghi's understanding of how water reflects light lifts her out of the class of landscape painters and puts her directly in the line of succession of Impressionist Art. In choosing a close-up perspective Chryssa Verghi's paintings appear almost abstract from the natural object. This mixture of light and the closeness of focus gives us an impression of the beauty of Greek landscape and also an insight into the ancient Greek mind. It is not for nothing that ancient Greek sculptures were originally very colourful. As Chryssa Verghi shows, they had to compete with the naturally powerful colours sourrounding them.